“There is another leak,” my husband looked up to the ceiling and back down to the floor near his feet. A drop of water ran down our yellow walls. He raced to turn the water off at the meter. I crutched after him and helped him dig through mulch and mud to find the shut-off valve. That makes six leaks in less than a year and no one can tell us why nine-year-old copper pipes keep leaking. The only answer to keep our belongings and house safe is to re-pipe…the whole house. When I slow down and look for His hand under the incessant drip of things like leaks, minor health issues, and repairmen who “remember my house” something happens. I find little things for which to thank God. We live on a pier and beam foundation making re-piping easier. All the leaks were found before they caused any horrible damage. My schedule is more flexible because I cannot drive (foot injury), so there are fewer scheduling conflicts with repairmen. Somehow gratitude refocuses my mind. I am able to slow my wildly beating heart and stop the twitching above my right eye because I see God at work. I see His plan in the midst of the wild and crazy. God uses gratitude to change my thoughts and soon my attitude changes too. I begin to see the ridiculousness in the situations. I see people as complex individuals who need grace just like me. I realize that my irritations are mine and I get to decide how to respond to them if I choose not to react. I can tell all the crazy things that seem to need my attention now to wait a minute. In those precious moments I can take a deep breath and choose how to respond. When I slow down to respond I can also acknowledge that all the things are stressful. That it is ok to feel a bit out of whack and overwhelmed. Then I can focus to figure out what is the next thing. The one thing I need to do now to take care of all the things. And then I can focus on the next and the next. Suddenly all the things while still big and looming are manageable. I have a plan of attack and with slow and steady progress I will handle them. All because I took a second to look for God’s hand, to express gratitude for what He is doing. 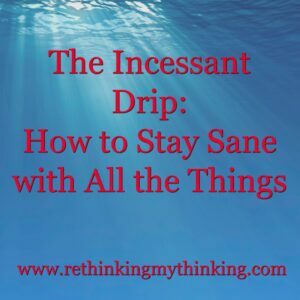 Staying in sane in the incessant drip requires us to slow down, look around, and thank God for He is good. What do you do to help manage all the things in your life? This entry was posted in Rethinking Challenges, Rethinking Christian Life. Bookmark the permalink.